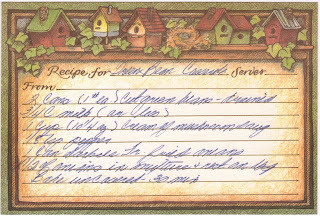 This recipe is almost exactly the same as the one on the French’s French Fried Onion can, but I wanted to post it anyway so you could see the card and study the tight, scipty font. 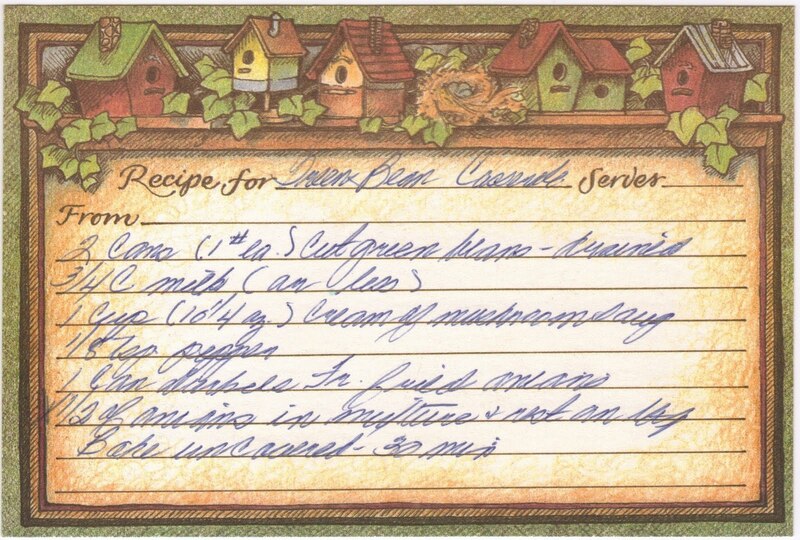 There are several recipes written in this same handwriting and a few might require some detective work in order to get the ingredients and directions correct. I like green bean casserole. In fact, it is the only way I’ll eat green beans. As a kid, my mom used to make us sit at the table until we ate all of our vegetables. For my brothers and me who are all picky eaters and will never be vegetarians, this scenario occurred quite frequently at our dinner table. Until we got our dog, Buck. I remember all the clever ways we found to distract my mom so that she wouldn’t know that we were feeding the dog under the table. Something tells me we weren’t half as sly as we thought. Looking back, I’m sure that (plus the fact I let the dog sleep in my bed starting the night we brought him home) had something to do with me and Buck becoming best friends. 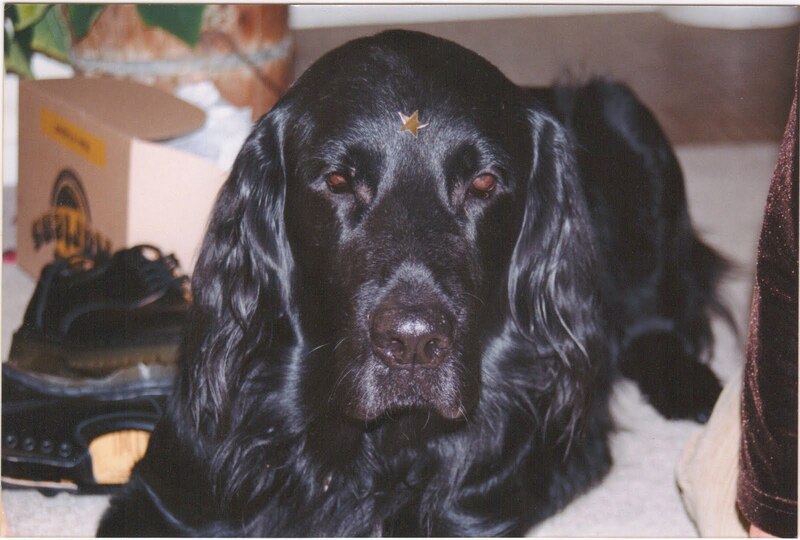 Like most dogs, he had an insatiable zest for life. He was the best running partner I’ve ever had. If we weren’t out for a run around town, then we were running in the back yard and playing Frisbee. And after a hard day of playing, I’d fall asleep at night with 90 lbs of Flatcoated Retriever lying across my back or wrapped around my head. I’m sure that is part of the reason for all the back problems I have now, but I wouldn’t trade those nights for anything. Life can be cruel sometimes and insanely unfair. When Buck was 9 years old, he began to have seizures. The dog we had before Buck also had seizures and died at only 5 years old. It was awful and we were very careful in selecting Buck so that we’d never have to go through that pain again. Only it did happen again and this time it happened to my best friend in the whole world. The vet tried medication, but it didn’t work. On Buck’s last day, he went into a grand mal seizure that he never came out of. I will never forget crying, holding his head while he shook and watching as he tried to comfort me. That was Buck. He cared more for the people in his life than anything else in the world. Some people may say that dogs don’t have emotions, blah, blah, blah. They didn’t know Buck. I know what I saw in my dog’s eyes and it was 100% pure love. Buck died the day before his 10th birthday. It took my family a while to bring another dog into our home and I didn’t know if I’d ever be able let another dog into my heart. I was convinced there would never be another Buck. 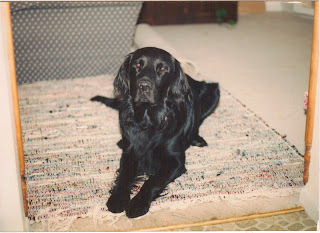 But since Buck passed, my family has had four other Flatcoats and now I have a dog of my own, my Golden Retriever Murphy. Each of these dogs has filled that void in my heart left by Buck in their own special way. Murphy has even reminded me what it feels like to have 75 lbs of dog sleep across your back at night. Now that I’m an “adult,” I can make whatever vegetables I want for dinner and don’t have to sit at the table until my plate is clear. But I still save a little bit to share with my dog. And I’ve discovered that green beans aren’t all that bad…well, when they’re covered in cream of mushroom soup and French fried onions that is. I bet Buck would have preferred them that way too. That was really a good story! Thank you for putting it on.